PETERBOROUGH, UK � "We knew that entering the mature liftgate market in the UK would be difficult. Therefore ten years ago, we started looking for partners and acquisition targets in the UK", declared Anton Griessner, VP Business Development. "Consequently in 2005, we started a cooperation with the Ray Smith Group. This project however abruptly ended with the unexpected receivership of RSG in December of 2007. In order to salvage our business investment, we decided to proceed with a pilot business development project and continued to look for acquisition opportunities for further development. Unfortunately at this point in time, we are out of options (for an acquisition) and have made the difficult decision to discontinue marketing our products in the UK." Our upmost concern is the welfare of our employees and existing customers. We sincerely hope that all members of the MAXON UK team will seamlessly find new employment opportunities. Rest assured that we will assist with this process in any way we can. To our existing customers, they too can be assured that we will keep supporting our Maxon products in their fleets. For years to come we will keep a large spare parts inventory with a partner organization in the UK. We will stand behind our product warranty agreements and will also keep up our established 3rd party service network. Consequently, we have added All-ind Ltd as another parts supplier to the UK market upon our withdrawal later this year. All-ind Ltd has a long-term working relationship with Maxon which will facilitate the replenishment of parts warehoused in the UK. All-ind Ltd and Humberside Tail Lifts will coordinate closely with each other to guarantee a professional parts supply to all customer segments. Nationwide Transport Breakdown Services Ltd ("NTBS") will be the single point of contact for our service agent network beginning in early November. NTBS will in turn work with Maxon Lift Corp. regarding payment of warranty claims, technical advice, etc. "This is a sad time for everybody involved in the UK project. Everybody has worked very hard and performed exceptionally well. Thank you in advance for everyone's support", says Anton Griessner. Any questions concerning this press release can be directed to Anton Griessner at agriessner@maxonlift.com. 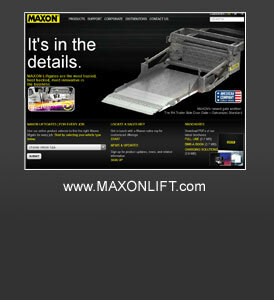 Maxon Lift Corp. was founded in 1957. That same year, owner Max Lugash invented the TUK-A-WAY� liftgate, which remains the largest selling style of liftgate in North America. For more than fifty years, Maxon Lift Corp. has initiated and developed a variety of innovative products that have become truck equipment industry benchmarks.